Yes, you heard that right! Rustomjee Group expanded its operations to United Arab Emirates and has opened its first international office in Dubai. Rustomjee Group just last week, kick started operations in Middle East by the way of creation of its first office in the region. The brand, that has established itself as among the most trusted names in the Mumbai real estate arena, has now added a new feather to their cap with the first ever overseas office in Dubai. With over 2 decades of experience in the highly competitive Mumbai Real Estate Market, delivering homes to more than 12,000 happy customers and completing more than 30 landmark projects from affordable to super luxury homes , Rustomjee is well poised for the international leap. Their office is located at Shaikh Zaid Road in Dubai, close to the Shangrila Hotel. Taking its philosophy of thoughtfulness to other countries now, Rustomjee is targeting the significant white collar Indian population in UAE. This includes entrepreneurs, executives in banking, oil & gas, construction and hospitality sectors. Industry estimates suggest that the UAE and GCC alone represent annual real estate investments of over Rs 5000 crores into Mumbai. While investing in a second or third home, a buyer need to take a few steps to safeguard their investment. Since the house will not be occupied by the buyer there are chances of them being the victim of fraud wherein the house has been sold to multiple owners by scrupulous means. Various other frauds may include selling a property that is on mortgage with the bank or one that has pending loans on it. To avoid these pitfalls, it is important for a buyer to verify the credibility of all documents like a title deed, encumbrance certificate, release certificate, surveyor’s report to ensure the property is free of legal complications. Also, while buying an apartment in a community housing layout, the committee or society responsible for the building should be contacted to agree in principal, to give the NOC. This ensures there are no pending dues or encumbrance on the apartment. In cases where the owner is an NRI, one must verify the Power of Attorney given to the person making the deal. Often times while purchasing a home it is advisable to apply for a home loan keeping the house as collateral. In this process, the bank also does a thorough background check to ensure the value of the property will not be diminished via illegalities. The involvement of a bank further safeguards buyer interest. Putting a small notice in the paper inviting any persons who think they have a claim on the property could be another safe guard. While these are precautionary measures, it is imperative to invest in property brought from or brokered via trustworthy sources. If one is buying a home within a community project, it is important to invest in projects of a reputed developer. This greatly reduces the chance of property fraud. As a reputed developer, Rustomjee ensures that the title deed is verified and clear of discrepancies, there are requisite approvals. Our emphasis on transparency and fair dealing has ensured that investors are happy to be associated with our projects. Forty percent of purchases in Rustomjee Urbania take place through customer referrals under our brand loyalty program. Also, buying into the projects of reputed developers mostly ensures the appreciation of your investment keeping in mind the location and future development of the surrounding area. As a principle, we ensure that we learn from our customers’ feedback and adhere to it in our future endeavors. We take this opportunity to thank our customers for their valuable inputs, feedback and appreciation. Here’s a link to our customer testimonials. Boman Rustom Irani, CMD Rustomjee and Secretary MCHI – CREDAI, explains why this year’s property 2012 exhibition is a definitive home-buyer destination. MCHI CREDAI works towards ensuring peace of mind through having all it members sign a code of conduct to follow the best practices thereby assuring the buyer of transparency in transactions. In this exhibition all properties that are sold would have the necessary approvals that are required. DNA’s Realty Gen-Next is a coffee table book on the city’s real estate industry and key luminaries who have shaped the real estate sector. In ‘The man who stands apart’ the CTB features Mr. Boman Rustom Irani, CMD, Rustomjee, who takes us through his journey of being a first-generation real estate developer and entrepreneur who has led every step that Rustomjee has taken to become a name to be reckoned with. Here’s a look into the highlights of Mr. Boman Rustom Irani’s journey in the Indian Real Estate industry – who was among the first to focus on the living experience, realizing the importance of cool lighting & thoughtful design. We are pleased to be a part of 276th year celebration of the “Vikrant Fest”. This festival celebrated as ‘Naval Week’, invites visitors to India’s well-known Aircraft Carrier Ship INS VIKRANT which has been converted into a Museum. Don’t forget to visit us at our Stall. Did you visit us at MCHI’s 19th Property Exhibition? Rustomjee launched two new projects ‘Global City Avenue I in Virar’ and ‘Azziano- a part of the Urbania township in Thane’. Bookings OPEN!!! 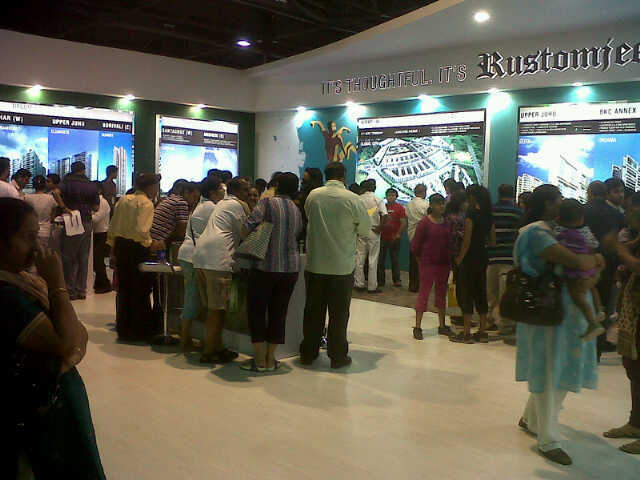 Visit our Stall ‘P-10’ before 8pm today to book your dream home!!! 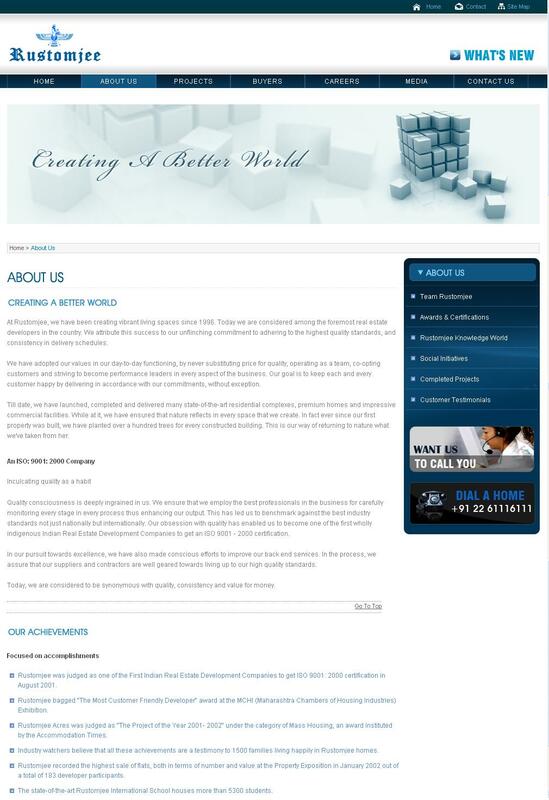 Creating a better world for you!